Squirrels are prone to invading attics because they share many similarities to a squirrel’s favorite natural place to nest: a hollow tree. Your attic is dry and warm, and most importantly, it’s safe from predators. 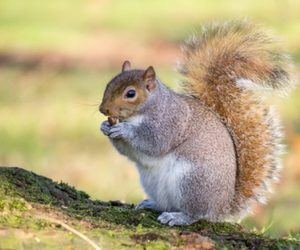 Female squirrels will seek out holes in the outside of your house to sneak into your attic and use your insulation for nesting material. Squirrels are most active in the morning and in the evening. You may hear them running around, or even fighting if there’s a litter. Squirrels will do their business in your attic, and the smell will slowly crawl throughout your house. As rodents, squirrels love to chew on things. Look for signs of chewed wood or pipes in your attic. While squirrels may seem harmless, they actually pose several dangers to you and your family. As rodents, they’re carriers of diseases and pests that can infect you. They’re also likely to chew through your house – in fact, squirrels have been known to chew through plastic pipes, causing massive amounts of water damage. We are experts at removing squirrels from your attic. We know not only how to get them out, but what preventative measures you need to take to keep them out. Contact us through our online form, or call us at 407.295.7194 and we’ll help you squirrel proof your attic!